BECOME A STUDENT OF PATTY WITT! The Instructor Training program is designed to develop thoughtful, creative, successful Pilates instructors. 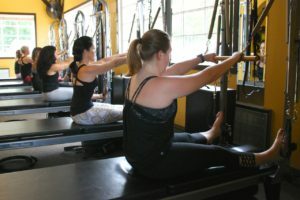 Mat, Reformer, Chair, Cadillac/Tower, Props & Anatomy. After successfully completing 400 combined hours of lecture, practice, observation, and teaching, students receive a Certificate of Completion. Contact Us to sign up for the next training course!